Beautifully engraved certificate from the British Columbia Power Commission issued in 1954. This historic document has an ornate border around it with a vignette of the British Columbia Seal. This item is hand signed and is over 51 years old. After the Second World War, one of the biggest obstacles to growth in British Columbia was power-or the lack of it. Outside Victoria and Vancouver, countless communities were scattered over a vast, rugged territory. To fulfill BC's potential, these smaller cities, towns, villages, and even individual ranches and homesteads needed the services enjoyed by the majority of the population in major centres. Numerous communities in BC did get power from small diesel and hydroelectric plants. Some of these tiny utilities were run by the local municipality. Others were privately owned and were often kept going with old-and sometimes unpredictable-machinery held together by all manner of materials and techniques. The Nanaimo office secretaries in 1960. Form left: Fran Fielding, Ruth Komarnick, Margaret Steel, Janet Norby, Nel Williams, Elsie Steel. In 1943, even before the war ended, the provincial Public Utilities Commission put a rural electrification committee to work investigating ways to bring electric power services to more BC residents. At the time, there were just over 206,000 electricity customers in the province and about 75 percent of them were served by BC Electric. By 1945, the provincial government was ready to begin its drive to bring "power to the people." 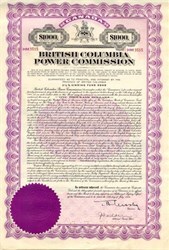 With the passage of the Electric Power Act in the legislature in 1945 by Premier John Hart, the British Columbia Power Commission (BCPC) was created. The Commission's task was twofold. First, it would meld the existing hodgepodge of generation and distribution facilities spread across the province-and outside BC Electric's territory-into one system. Second, it would extend service to many communities that didn't have power at all. The goal was to spur population growth and industrialization in BC. In July, the Commission acquired its first utility, the Nanaimo Duncan Utilities (NDU) on Vancouver Island. Fifteen years later, the Power Commission had added more than 200 communities to its system. The BCPC merged with BCE in the early 1960's to create the new BC Hydro. History from company press information.